The PX-Q657 Flashfinder® aerial leak detection set is state of the art in precision fiber optic fault location. This set is comprised of the patented PX-Q650 Flashfinder® detection gun and a PX-Q410 tracer source. 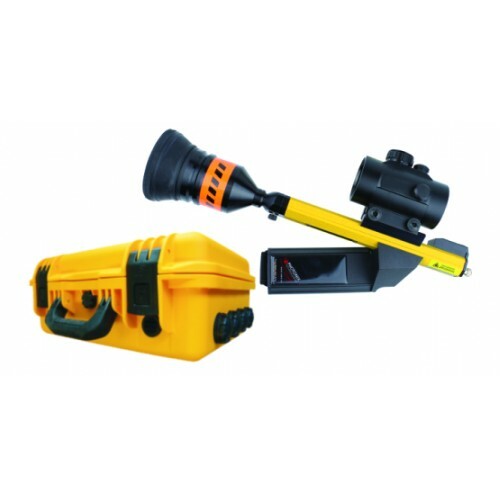 It is designed to find infrared radiation from firearm, rodent, or burn damage in aerial cables as well internal splice enclosure fiber faults. While an OTDR can find approximate distance to a problem, pinpointing problems in the real world is more often about luck, intuition, or trial and error. The patented PX-Q657 can locate aerial cable faults from ground level or a single bucket location. It can also be used to pinpoint faults inside a splice enclosure or hub using interchangeable heads. To use the Flashfinder® probe, simply squeeze and hold the trigger and sweep over a suspect area.